There is still widespread angst that comet 2010 X1 Elenin will cause significant earthquakes when it comes close to Earth later this year. I’ve shown previously that Elenin is not associated with earthquakes, however, in the comments (and on the intertubes), an as yet unpublished paper by Mensur Omerbashich titled “Astronomical Alignments as the Cause of ~M6+ Seismicity” http://arxiv.org/abs/1104.2036 is referenced. The paper purports to show that astronomical alignments, particularly that of Elenin, are the proximal cause of earthquakes of magnitude 6 or stronger. To save you time before you read the paper and my critique of it, I’ll give you a short and long summary. Short Summary: It’s nonsense on stilts. Longer Summary: A sloppy paper which presents incorrect data. It ignores basic information on comets, basic physics and its “evidence” is drawing lines thorough planets. The idea that gravitational influences could alter the frequency of earthquakes is plausible. The tidal bulge in the Earth (as opposed to the tidal bulge in the ocean) is about 30 cm, and a periodic flexing of the crust by 30 cm could indeed trigger earthquakes. Indeed, there is a weak correlation between the lithospheric tides associated with Full/New Moon and a subclass of shallow earthquakes (increasing the probability of this subclass of earthquakes by less than 1%). On the 27th of February 2010, Elenin was beyond the orbit of Jupiter, but it is claimed that it had more tidal effect than bigger comets and asteroids closer to Earth. However, tidal force drops of as the cube of the distance. The Sun is much more massive than the Moon, but the Moon has a bigger effect on Earth's tides because it is so much closer. Venus has around the same mass as the Earth, and is the closest planet to us, but it produces roughly on ten millionth of the tidal force on Earth than the Moon does. 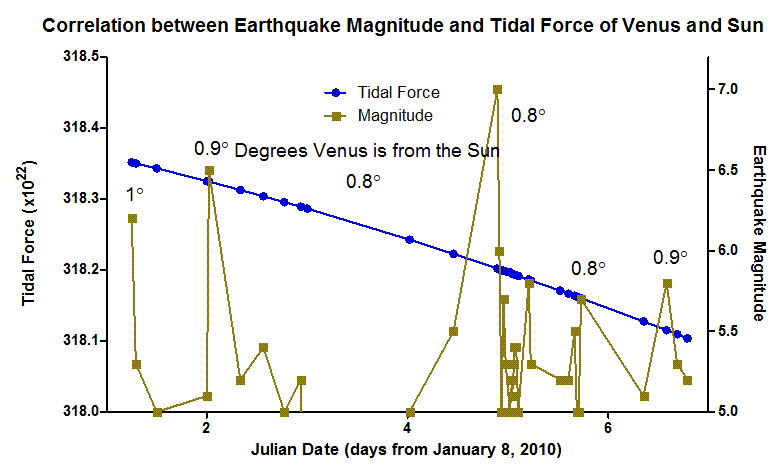 If the Moon is not very effective at producing earthquakes, Venus sure won’t be (and invoking electrical or magnetic forces won’t work either, they fall off rapidly with distance too). To assert that planetary alignments are a significant influence on earthquakes you will need some pretty strong evidence, does this paper supply it? 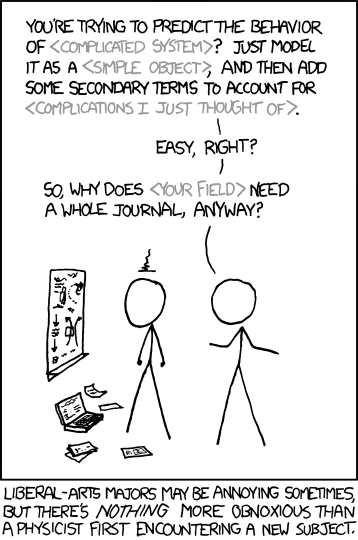 XKCD sums up the problems with the paper. Coma confusion: You know the paper is not going to go well when it starts off with “..[Elenin] drags with it a cloud of gravitational locked particles around 30,000 Km across, making its gravitational shadowing significant …[page 1 para 4]”. Leaving aside the question of what “gravitational shadowing” is (it is never defined), Dr. Omerbashich is describing the coma of comet Elenin. However, the coma is by no means “gravitationally locked” the particles in the coma are only loosely bound and are readily lost, the coma only appears stable because new dust particles are currently being added by outgassing from the comet. Indeed, as I type Elenin’s coma is dispersing, as its dust production rate has dropped (possibly due to having exhausted a layer of volatiles, eg frozen carbon dioxide, below the comets crust). Also, while the coma is thick by interplanetary standards, from the point of view of Earth the coma is still a pretty good vacuum, with negligible mass compared to the parent comet. Not only that, a coma is a feature of all comets that approach the Sun closely, for example comet 81P Wild had a coma of 50,000 Km and 103P Hartley had a coma of 150,000 Km. Because the coma is dynamic, produced as a comet heats up, at the early time points Omerbashich considers, Elenin’s coma would be much, much smaller. What’s missing? The first thing that stands out when you read the paper is what is missing. All the classical planets, as well as Uranus and Neptune, are considered along with comet Elenin. But it’s obvious what is missing. Where are all the Main Belt Asteroids? If you are going to consider a 4 Km wide frozen snowball, then large chunks of real estate like Ceres, Vesta (529 Km in diameter), Pallas and Juno should be considered as well. And what about the 46 comets that reached perihelion in 2010, especially comets comparable to Eleinin such as Comet 81P wild, a comet of 4 km diameter with a 40,000 km coma, that came within 1.2 astronomical units (AU) of earth and comet 103P/Hartley, a 2 Km diameter comet with a 150,000 Km coma that came within 0.13 AU of Earth? Why aren’t they included if Elenin, which was more than 6 AU away for most of the year, is? What’s also missing is the Moon, mostly. There are a few lunar alignments shown, and 14 of the 24 Full and New Moons are marked in table 1, but as the Moon is the closest, most important tidal object in our sky, the complete lack of 10 lunar encounters is significant. Figure failure Figure 1, (section B shown below) purports to show the “resonance magnification pattern” as a “gravitational shadow” traverses the Earth. What it in fact shows is a series of graphs of earthquake magnitude vs time. Each quake is shown equidistant from the others, regardless of the actual time separation between them. As well several points are left out, this greatly distorts the actual data. For example graph B of figure 1 shows the series of earthquakes from 10 January to 12 January. 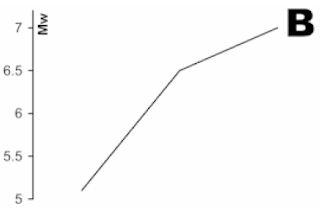 It looks like a smoothly rising curve (possibly correlated with the “gravitational shadow”, whatever that is). However, only one magnitude 5.1 quake is shown, whereas there were many 5+ quakes in this time period. Also, the time point of 11 January is omitted even though there were no quakes of 5+ in this period of time (the other graphs have similar issues). This makes the curve look quite different from reality. This graph shows how it should have been done (click to embiggen). I have plotted quake magnitude vs Julian Day number since 8 January for the interval between 9 January and 14 January, (full Julian day numbers make the graph unreadable), UT times of earthquake occurrence being rounded to the nearest half hour for conversion to Julian dates. During these dates Venus was a degree or closer to the Sun (Omerbashich never really gives a numerical criterion for what constitutes an alignment). 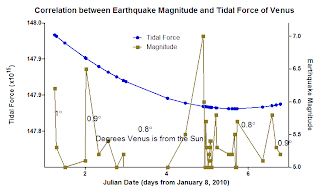 I have also plotted the tidal force due to Venus at the time of each earthquake (Calculated from the formula below using Excel, planetary masses and distances from SkyMap and earthquake magnitude from here), it is falling over this period as Venus is moving away from the Earth. You can see that this graph is very different to the one that Omerbashich provides, and refutes Omerbashich’s claims. Now this is just one graph out of a whole bunch, but each one has similar, fatal flaws. They all show M+6 events evenly spaced, regardless of when they occurred, and omit relevant 5+ events. When a 5+ event is included, it is to anchor a graph and give a misleading impression of a smooth curve. 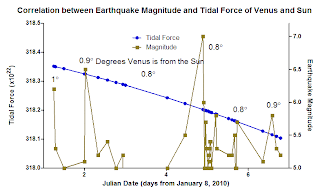 As the tidal effect is actually due to the Sum of the tidal force of Venus and the Sun, I also show a graph with the Sum of the Venus Sun tidal forces (again, click to embiggen). You can see that they are going down. This is mostly due to the earth moving away from the Sun post perihelion, as the tidal force of Venus is one ten millionth of that of the Sun, it doesn’t register in this graph. Statistics revisited Table 2 of the paper purports to show all M6+ earthquakes in relation to various alignments (it doesn’t, but the discrepancies are minor, just an example of sloppiness). It looks kind of impressive, until you think about it. All Omerbashich is doing is lining up instances of events with earthquakes. Using this method I can show that my family eating pizza causes earthquakes. On March 4 I had pizza, and there was a M6.5 Earthquake, and again on March 11 (an impressive M6.9 quake) and on March 25 (only M6.6, but there was an M7.5 earthquake when we had pizza on June 16). All in all, 20 times when we had Pizza there was a magnitude 6 or greater quake (actually, we had pizza more times than that, but those are the times that I have dates and UT times for). Apart from the physical implausibility of my family chowing down on pizzas causing earthquakes (well maybe my increase in weight could do it), how can we determine if eating pizza causes earthquakes? Statistics is how. In 2010 there were 156 earthquakes of magnitude 6 and over. In 2010 we had pizza 48 times. If the earthquakes were occurring at random with respect to our eating pizza, then we would expect an M6+ earthquake to occur on a day we ate pizza 21 times, and we observed 20 earthquakes on days we ate pizza. Therefore we can conclude there is no connection between us eating pizza and earthquakes (physical implausibility aside). So, what about the planetary alignments and the earthquakes? The most plausible astronomical source of earthquakes is the Moon, which causes the strongest lithospheric tides. There were 24 full or new Moons in 2010. This is where the Sun and Moon are aligned and we get the strongest tides, which might have a chance of producing earthquakes (or triggering ones that were just about to go anyway). In 2010 there were 12 earthquakes that corresponded to a full or new Moon. By chance alone, we would expect 10 earthquakes to correspond to the full or new Moon, which is not significantly different from what we observe. We can do a double check, if the alignment idea is correct, then there should be more earthquakes during the full/new Moon (when the tides are highest) than during first and last quarter (where the tides are lowest). In fact there were 16 earthquakes during first and last quarter Moons compared to 12 during full/new Moon. Thus the idea that lunar alignments are a significant source of earthquakes is disproven. Actually, e have one more trick up our sleeve, I took all M6+ earthquakes from 2000-2010 and did a Fourier transform on it. If the Moon played a significant role, we should have seen a peak corresponding to the interval between full and new Moons. But we don’t, or any other peak corresponding to an astronomical alignment. This pretty much eliminates all evidence of astronomical alignments playing a significant role in earthquakes. Omerbashich spends a lot of space on alleged Elenin alignments, but it's just the pizza gambit again. The plausibility of Elenin being responsible for any earthquakes is very low. If the Moon can’t produce significant numbers of earthquakes above baseline activity then Elenin, with a tidal force of less than a billionth of that of the Moon, is not a plausible candidate for producing earthquakes. Again, completely ignores comet 81P (which had a thousand times more tidal force than Elenin) and comet 103P/ Hartley (which had a million times more tidal force than Elenin at its closest approach to Earth). 103P is pretty much devoid of association with earthquakes. The rest of the paper is pretty much cherry picking figures. Figure 2 basically shows that the occurrence of M8+ earthquakes is pretty random, but Omerbashich claims this shows that comet Elenin (a 4 Km chunk of dirty ice) has been influencing earthquakes since 2007 (when it’s tidal force was a trillionth of that of the Moon). Yet somehow, mysteriously all the other, closer comets (including much bigger ones, like 2006 P1) had no effect. Conclusion Omerbashich’s paper, “Astronomical Alignments as the Cause of ~M6+ Seismicity” is a poor paper, with inadequate and misleading data analysis, and which misunderstands basic physics and cometary nature. It provides no evidence that Elenin is involved in earthquakes. Postscript: at this site, it was claimed that planetary alignments as predicted by Omerbashich would produce big earthquakes on 23 May 2011, 23 (and 24) May have come and gone, with only a couple of magnitude 5 quakes, fairly quite days really. Dr. Omerbashich's web site claims 9-19 May as a time of intensified 6+ quakes. It wasn't. Post-postscript: I've beening trying to think of a really simple way to get the scale differences between Eelnin and the other objects in the solar system that people can grasp easily. Dr. Omerbashich likens his resonator effect to that of a group of soldiers marching in lockstep across a bridge, causing damaging resonances in the bridge. Well, imagine the Moon is a 70 Kg soldier marching along, behind the soldier is an ant marching. Do you think the ant will add to the resonance produced by the soldier? No, the mass of the ant is far too small. AND that ant is 10 times more massive in relation to the soldier than Elenin is to the Moon. Disclaimer: small portions of the original paper, less than 1% of that work, are quoted with appropriate citation and links to the original under the fair use provisions of the copyright act for the purpose of criticism, comment, news reporting, teaching (including multiple copies for classroom use), scholarship, or research. The Earth quakes were not caused by gravitation. They were caused by HAARP. By sick occult worshiping humans who like to play god. March 11/11 = 3/11/11 = 3/1+1/1+1 = 3/2/2 = 322 = SKULL & BONES. The alignments represent the ancient trinity of God, Father (sun), Mother (earth), Son (Elenin). It was a sacrifice by the sickest most demented animals this world has had to endure. The other dates have occult meanings as well and their alignments similarly represent the old trinity. Elenin's tail will sweep the earth in October. The solar winds will be reduced by 1/2 when this occurs (as per measurements taken by previous space probes inside comet tails). This will cause the earth's mantle to vibrate and potentially crack in places. There will be severe winds and rain. It could even cause another great flood with so much dust in the tail forming massive rain clouds all over the world. It will be pure hell. What people should really be investigating is what happens when the comet tail sweeps the earth in October. When the power goes out due to Elenin for days on end, what is going to prevent all those Fukushima type nuclear reactors from blowing sky-high in the US? Every last one was designed to blow when they loose power. They were designed that way for a purpose ... and it has a lot to do with the timing of Elenin. Elenin has been an ancient secret for eons, kept neatly tucked away from mere mortals. The world is about to learn what that ancient secret was all about. Gee Revelation says earthquakes in divers places, you will see the son of man coming in the clouds of heaven (book of mathew) There was a great earthquake, the sun was as saccloth the moon turned to blood, a hail and fire fall from the heavens (Elenins tail) then an angel tosses a burning mountain into the sea...I think Ill trust a book that 2000+years old instead of a guy whos what in his 30's. Oh thats just the beggining Revelation, it gets better after that. There has never been another time in the last 5000+ years, that a comet tail has washed over the earth. The average tail is 1.5-2 AU. Some tails have measured 4 AU. Elenin has been in space a very long time and its tail will be above average. When it passes in front of the sun the tail will completely engulf the earth. That has never happened since before the Egyptians built the pyramids. Solar winds impact weather. High and low pressure systems are highly influenced by the sun. NASA has measured solar winds inside the tail of comets. They measure nearly half the speed as normal. For you to say that will have no impact is purely irrational. When the tail of comet lights up the night sky in early September, a lot of people are going to start to truly understand what is coming. Are you promoting your blog as an honest and open blog with logical/rational thinking behind it? Or does your blog have ulterior motives to mis-inform, like so many others? Elenin's tail will be enormous and will engulf the earth. That will have an impact. And likely a very significant one. "Are you promoting your blog as an honest and open blog with logical/rational thinking behind it? Or does your blog have ulterior motives to mis-inform, like so many others?" It needs to practice what it preaches, No guts to leave a name or links to real sources of info. Ian, you will need to block Anonymous comments, if possible. rgds CometAl. Oh Ya thats what we really need more cencership CometAl NOT! No I dont see that nothing is happening Ian when the tail washes over the earth. Kinda hard to see when it has not happend yet. Oh I suppose you are a seer of things to come. Oh wait I'm sorry, you can tell when something is going to show up at your doorstep. Its because you ordered that pizza 20 min ago. so therefor you can forsee its arrival.Glad you ordered up comet Elenin too. Hey anonymous.... Google "What is a meteor shower?" you idiot. "A meteor shower is the result of an interaction between a planet, such as Earth, and streams of debris from a comet." It happens MANY times every year. What planet are you from? Anonymous said: "There has never been another time in the last 5000+ years, that a comet tail has washed over the earth." Apart from when Earth passed through the tail of Halleys comet in 1910, http://cometography.com/hysteria.html, let alone the Great Comet of 1881. The length of the tail of a comet is independet of how long the comet has been in space, Elenin's tail is, and will be fairly small (if Elein survies passage of the Sun). Even if it is relative large, a comets tail is a pretty good vaccum compared to Earths' atmosphere. As with Halleys tail (which was quite impressive and large), absolueltly nothing will happen. Cornell University Dr. Mensur Omerbashich paper, "Astronomical alignments as the cause of M6+ seismicity." another 9+ earthquake in 2011 is highly possible. intention experiment wrote: "8 15 2011 (neptune moon earth mercury sun venus)"
Aside from Venus, that's a pretty sucky alignment, Neotune and Mercuy are over 5 degrees away from the Sun-Earth Moon Axis. 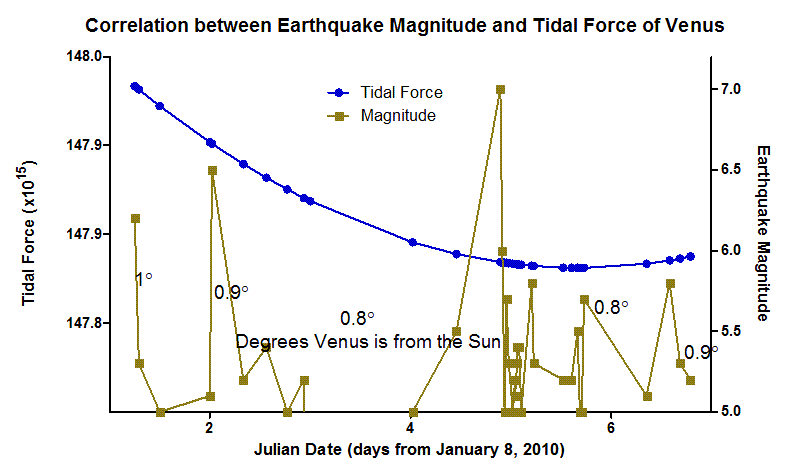 As the gravitational force is a vector sum, the contribution of Mercuy and Neptunes tidalforce is even smaller than the one 100 millionth contribution they would make to the Sun-Moon effect if they were directly alighned (you DID check out the units on the graphs in the main psot, Venus's tidal force is one ten millionth of that of the Sun, and roughly 100 Millionth of the combined Sun-Moon tidal force. If there is a M9 earthquake, it won't be due to any of the alignments you show. Do the tidal force calculations yourself. Comet Al wrote: ..you will need to block Anonymous comments, if possible. This is mild stuff, I'm used to the raw venom creationist commentors spew (see some of the comment threads on my Pandas Thumb posts). If someone gets seriously nasty to others they will get canned, and remember folks, kids read this, so watch the language. Look, I know it looks significant when Venus lines up with the Sun and the Moon, but space is really, REAALLLYYYY big, and out in the vasty dark even massive plaets like jupiter are insignificant specks. I'll say it again, I the combination of Sun and Moon can't produces a significant number of earthquakes, adding in focrecs on the order of one tenmillionth or less will not do it either (and you have exactly the same problems with electromagnitism, in spades). Still, everyone can do all the calculations I've done here, with goodgle docs spreadsheets (okay, Fourier transforms and chi sqaured tests are harder, but they are just a calculator away), and can see for themselves how insanely tiny these forces are, follow the links, downlad the data and get calculating. Ian, if they had the capability (or desire) to understand the science they wouldn't be spouting this nonsense to begin with. Well, back to my orbital mechanics thesis with the JPL Solar System Simulator! And AmeriKA is going global. Any form of post blocking is nothing but pure censorship. PERIOD. CometAl, you another gatekeeper of truth and a master of lies? There are powerful forces behind the scenes in all aspects of what is transpiring through these last few months of this final Universal cycle. Elenin is the key to unlocking all the mysteries. Posting anonymous is more about personal survival than proving anything to anyone else. There are those who will read and see. They will search for the light for themselves. Those who see, live. Those who don't, won't. Anonymous wrote: Any form of post blocking is nothing but pure censorship. PERIOD. No, we can block people for spamming, being abusive, or using excessive foul language (this is an all ages friendly blog) quite legitimately. Also, people who werble on content-free, reducing the signal to noise ratio can be plonked as well. I haven't discovered any comets, but I've been following comets for decades (and successfully imaging some over the past 15 years). As an astrobiology fan, I have to odd bit of information about comets as well. Also, my day job is data analysis (hence all the graphs I made for this post), and I can do basic orbital dynamics. Have YOU done any analysis of Elenin data? Have you done a statistical analysis of the correlation of earthquakes with Elenin alignments? What were your answers? You didn't know that Earth has passed through Haley's comets tail, when that knowledge is available freely (and linked to in the main post and known to almost every amateur astronomer). Yet you feel free to claim we're pushing disinformation. If Elenin survives its encounter with the Sun, it's likely that you will be unable to see a tail at all without binoculars. C/2006 P1 it is not (t is more like comet C/1999 S4. Dissenting opinion is all very well, but you need to back up your opinion with facts (like those in the above post), otherwise you are just pushing yet another failed comet panic. What chemical is comet Hartley 2's gas cloud made of? If comet hartley 2's gas cloud is as large as jupiter should comet hartly and other large gas shrouded comets be now registerd under a whole new catagory or as a gas giant planet? When Comet C/2010 X1 (Elenin) passes earth will the gas surounding it chemicaly alter earths atmosphere? If comet Hartly 2 s gas coma is the size of Juipter and it were to have passed 5 LD from us between us and the sun would we be enveloped by its gas and what would the chemical (cyanogen radical) Cyanide componet of the comets gas do to our atmosphere. one ranting comment has been plonked. Play nice. The average density of the coma is around 100 molecules per cm^3, which is about the density of the atmosphere on the surface of the Moon. Of course, the density falls off with distance, near the surface of the comet the Coma is around 10^11 molecules per cm^3, while out at the periphery it's around 10 molecules per cm^3. By contrast, the atmosphere near the surface of eath has 10^19 molecules per cm^3 and the surface of Mars 10^17 molecules per cm^3. Thus the coma of a comet does a pretty good vacuum impersonation (10-5 Torr, even at its densest. It is only visible by the fluorescence of the gas molecules and reflection from the dust grains (and even them we see it only faintly, despite the long depth of vison through the coma). The major component of the coma and comets tail is H2O (~90% of the gas when the comet is closer than 3 AU), the rest is things like CO CO2, CH3OH, CN, C2, C3 and a number of other complex species. Even if Earth was deep in the outer coma (which it won't be, being 35 million Km away at closest approach, 10^10 molecules of CN per cm^3 will do sod all to our atmopshere (just as Halley's tail did sod all to our atmosphere). For 103P Hartley, at 18 Million Km away (10 times the size of its coma), we might expect one molecule of CN per cm^3. Which, as we observed, did sod all to us. 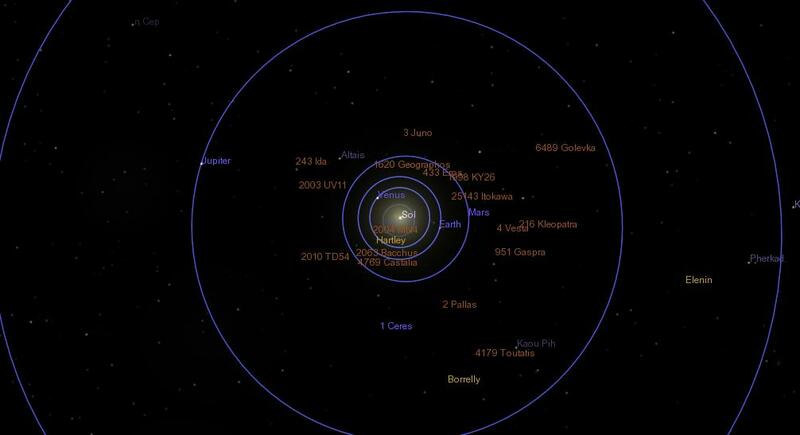 Comet Elenin will be 20 times further away, so not much will happen at all. More rants deleted. Let me know when you are ready to discuss actual evidence. First of all, to the people on here worried by Elenin's tail. You obviously do not understand the physics involved. The tail of the a comet always points AWAY from the Sun! Why, you may ask? Solar winds! We will not go through the tail of the Elenin because the solar winds will have pushed them away by the time we cross the trajectory it had traveled. The Average Solar wind speed is in the neighborhood of 400 km/s! Let me state that again, 400 kilometers per SECOND! As to the Ian’s assertion that there are no parallels between earthquakes on the Earth and the alignments of Elenin; I would submit that this is a "rabbit hole" that you have been taken down by the Omerbashich. I do not disagree with your “pizza” null hypothesis testing procedures. However, I would thoroughly disagree with your assertion that the Moon has no influence on the Earth as it is clearly obvious that it does. Further, there are now schools of thought that would suggest that CMEs and thus the pulse wave that is generated from such an event, hitting the Earth may attribute to large M6+ earthquakes. While we can both agree that the mass of such an energy wave, when broken down into protons per CM cubed doesn’t sound like a whole lot; you would also have to agree that we are talking about that mass hitting the Earth at significant velocity, which does impart kinetic energy. Therefore per this hypothesis, and yes it is a posit, when this wave hits the resulting bounce back, due to Newtonian physics, could be a factor into what causes some earthquakes. More so, the crux of the issue is that nobody has figured out how to really predict earthquakes. The Moon, the Sun, Elenin, Ian’s family eating pizza…they are all hypothesis! To make a long story short Ian, while your methodology is sound, removing cause and effect from valid discourse is problematic at best and is not sound scientific discussion. This is especially true when you use caustic and derisive analysis to make your point. By definition, when you have thus stated your position using those methodologies, you have then lost your objectivity! Elenin was just discovered….the more we observe…the more accurate our data will be on the body. Who’s to say that it isn’t bigger than what they are saying? Who’s to say that there are not other interactions going on that are not being observed that then would substantiate alignments? For comparison, we have to look no further then the two asteroids that will be in close proximity to the Earth around the same time period (can’t think of their designations at the moment); which NASA has reported to have been interacting with the Moon, within the ultraviolet spectrum. Going to the whole Electric Solar System model may or may not explain earthquake et.al. I know I have been being purposefully obtuse to my position and that is because neither I nor anyone else can positively predict what will occur until we have better data. And we will not have that for another couple months. So “chillax” people, it not like it’s the end of the world! Anonymous wrote:"However, I would thoroughly disagree with your assertion that the Moon has no influence on the Earth as it is clearly obvious that it does." Evidence? There is no effect of the Moon seen in raw Earthquake numbers or magnitudes. Nor can you pick anything up with Fourier analysis of 10 years of earthquake data. This is a use of the word "obvious" with which I was previously unaccustomed. Anonymous wrote:"Who’s to say that it isn’t bigger than what they are saying?" Evidence and basic physics. We've been observing Elenin intently nearly half a year a year. If Elenin is substantially bigger, we would have detected this in our multiple (hundreds) measurements (and its orbital mechanics would be obviously different). Anonymous wrote:"Who’s to say that there are not other interactions going on that are not being observed that then would substantiate alignments? " 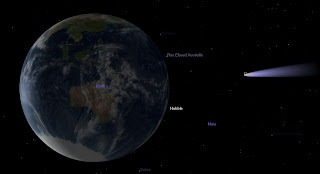 Anonymous wrote:"For comparison, we have to look no further then the two asteroids that will be in close proximity to the Earth around the same time period (can’t think of their designations at the moment); which NASA has reported to have been interacting with the Moon, within the ultraviolet spectrum." I find this all very interesting. Not being a smart man I appreciate hearing from both Anonymous and Ian's viewpoints. Although, admittedly Ian loses me in some of his calculations. Not being a smart man I have to rely on my God given ability to sense when something isn't right. With Elenin that occurred when the NASA Buzzpage went off line the next morning after a post was put up that Elenin was going to pass closer to Earth than NASA has estimated. I happened to witness this as I was on the Buzzpage when the post was entered. The next morning I thought I would copy and enter the post to send in an email to a friend. I was very disappointed to see the site was down. Although pleased that they were going to make improvements to it. That was March 3rd or 4th. It's still down today Jun 1st. Now I'm no NASA rocket scientist, but I have updated and changed a website. I made my site changes in the background and then applied them when I was ready. It's very fast, very easy, and takes a total of about 10 seconds. I find it hard to believe that the rocket scientists at NASA are taking this long to load the site improvements. This causes me to speculate that the reason they took the site down had something to do with the Elenin post. I know that Ian has all of these calculations saying the comet is nothing which is also what NASA has been saying. I thank him for posting his calculations. I'm just wondering if any of his data used in the calculations came from NASA. They've hidden several things in the past which they eventually had to disclose. Just another note because I thought it was interesting. Are you aware that when Mensur Omerbashich tried to patent his theory it was denied because the U.S. Government claimed the patent. In the U.S. the government has the right within one year to claim any patent designated by the government as vital to national security. As with most of our freedoms, so much for property rights. Dste01 said..."With Elenin that occurred when the NASA Buzzpage went off line the next morning after a post was put up that Elenin was going to pass closer to Earth than NASA has estimated." Firstly, NASA hasn't been calculating anything about Elenin, it's the amateur and professional astronomical community (JPL uses this for its solar system simulator, used by NASA, but NASA doesn't generate the data). Secondly, NASA should take down incorrect data. Elenin will not come much closer to Earth than calculated. Dste01 said..."I know that Ian has all of these calculations saying the comet is nothing which is also what NASA has been saying. I thank him for posting his calculations. I'm just wondering if any of his data used in the calculations came from NASA." No, amateur and professional astronomers, the US earthquake service and plain old stats. Dste01 said..."Are you aware that when Mensur Omerbashich tried to patent his theory it was denied because the U.S. Government claimed the patent." why do the freemasons expect to see elenin or something on august 10th 2011 from penn.ave looking @the whitehouse,,where the full moon is setting directly over?it is said washington is built to watch for such an event aligned with the stars...the moon is supposed to look as if giving birth from its side..and what of all the other seeing stones,used to watch the sky and mark "somethings" passage...history is full of such stuff,and u.s. capitol has one also...could someone investigate comets position on august 10,and post findings here? Sorry for copy and pasting. I thought you might be interested in this. Did you have this much trouble with your patent? Anonymous wrote: "why do the freemasons expect to see elenin or something on august 10th 2011 from penn.ave looking @the whitehouse,,where the full moon is setting directly over?" Because they are idiots? Elenin sets at the end of twilight on the 10th of August (and is too din to see without a telescope anyway at M10) and the full Moon is on the 13th. dste01 said..."I thought you might be interested in this." I've seen it before. I think the good Dr. has issues (he wants one trillion dollars for a patent, that's , um, unrealistic to say the least). I think it's all in his own head, there are no independetly verifiable sources for his claims, and I can't find his thesis in the UNB electronic thesis repository, as he claims is there. From looking at your responses on this blog, there is a clear propensity that being caustic, derisive, patronizing, and/or condescending is the only methodologies that you are familiar with when responding to either a reasonable or an unreasonable debate. Given that analysis, I will lower myself to your level so that perhaps you will understand that which you have either purposefully ignored or do not understand. Ian: “Evidence? There is no effect of the Moon seen in raw Earthquake numbers or magnitudes. Nor can you pick anything up with Fourier analysis of 10 years of earthquake data. You will also notice that I didn’t say anything about earthquakes. You did! I was simply stating the fact that the Moon does affect the Earth’s surface. I realize that by your own admission that you are not an Astrophysicist, a Geologist, or a Seismologist; that in fact you are a Analyst. However, are you really going to ignore any statement of fact because I didn’t provide evidence? That evidence of a fact is needed of what has been known for close to four centuries and that to date is undisputed!?!? You are aware of the SCIENTIFIC fact, that the alignment of the EARTH, MOON, and SUN is responsible for tides, right?!?! That due to the gravitational pull on the Earth, by the MOON and the SUN, a bulge is then formed on the surface of the Earth, right?!?! And that said bulge is what cause the tides, right?!?! What do think happens when you put that type of tension on an area that is already stressed with tectonic movement? Further, isn’t this the very good example of an alignment phenomenon, which illustrates an example a known cause and effect; that we can then use to postulate an opinion on of an alignment of Elenin, the Earth, and the Sun? Just so that we are clear hear, I am ACCUSTOMED to when speaking with a person whom I have ASSUMED to have some foundation or training in the Sciences, that the type of fact listed above would be self-explanatory, especially for someone who purports to be a Amateur Astronomer. I would NEVER ASSUME that something as basic and OBVIOUS as this would have to be explained in detail. Further, I am UNACCUSTOMED in having to document something that BASIC with a Fourier analysis! So, if we take that OBVIOUS, BASIC, and SCIENTIFIC fact to a logical conclusion, then it is OBVIOUS that the Moon does influence the surface of the Earth; ergo it is OBVIOUS that the Moon plays some role in seismic activity. Perhaps you have some other documentation that states that the Moon doesn’t affect the Earth’s surface and tides, I would really love to read that little gem! You will notice that I have not stated how large a role the Moon play. The reason is, as it was in my first missive, because I nor you nor anyone else knows! If they did they would be able to document it and we would have a better predictive model for seismic events. But for you to say that because it is not supported by a Fourier analysis, and therefore should not be considered, escapes rationale thought. Anonymous (which anonymous?) wrote:"You will also notice that I didn’t say anything about earthquakes. You did! I was simply stating the fact that the Moon does affect the Earth’s surface." In a post that's devoted entirely to the astronomical links to earthquakes, specifically the Moon and earthquakes, what did you expect. And if your point was "hey look, the moon causes tides" well, you DID actually read the post, didn't you, where tidal motions of earths crust were explicitly discussed. And where the entire point of the post is to use explicit tidal force calculations to see if you could link the two together. Anonymous wrote:"What do think happens when you put that type of tension on an area that is already stressed with tectonic movement?" Go back and actually read the post, paying particular attention to the section where I discuss lithospheric tides. 0.16AU is (24,000,000 km; 15,000,000 mi). Lots of rhetoric, but what about a simple explanation for the coincidence of alignments and significant earthquakes (February 2010, September 2010, March 2011). If Elenin has no substantial mass and can't effect the earth's techtonic plate movement, then what is the explanation for these coincident events? Did you miss thae ca;culations and graphs which form the core of the argument (scroll back up and have a second look). 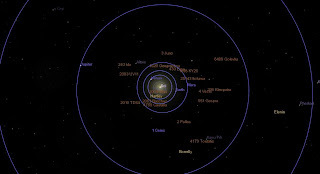 At closest approach 16 Oct 2011 19:54 UT, the comet will be near coordinates 08 59 44.61 +24 34 03.0 in Cancer. The comet will be 72.7° from the Sun and 56° from the 81% lit moon. "how can we determine if eating pizza causes earthquakes? " Well, pizza is known to cause comet gas..
"On 1910 May 19, Halley’s Comet passed directly between the Sun and Earth(1P/Halley 1910-May-19 04:09@0.05° and 0.16AU from Earth)"
This may not be a fair comparison considering Halley's inclination of 162 deg vs what is essentially an ecliptic Elenin(1.8 deg). There may be a difference between "looking down the shotgun barrel" vs a glancing passage thru the tail. Aside from the debris collisional aspect, it would be interesting to see what the plasma induced electromagnetic effects would be during the alignment. window. AnonymousDoug wrote: "This may not be a fair comparison considering Halley's inclination of 162 deg vs what is essentially an ecliptic Elenin(1.8 deg). There may be a difference between "looking down the shotgun barrel" vs a glancing passage thru the tail." No, Halley was directly between us and the Sun. Bigger comet, bigger tail, twice as close. Elenin is a feeble thing by comparison, and it's tail is a good approximation of a vacuum. I was actually talking about the impact of the "alignment window" with respect to the comets/tails. Elenin/Earth are moving in the same direction (different speed, of course) producing a longer alignment window then the non-ecliptic Halley. BTW, I hope you do recognize that the notion of an "alignment" is window based, and not a singular moment in space-time, which appears to be the central theme of the subject author you criticize. AnonymousDoug wrote: "I was actually talking about the impact of the "alignment window" with respect to the comets/tails." I know that, and it is inconsequential. Should the comet survive it's encounter with the Sun, Elenins tail will seep over us very briefly, not much more than a day, and at a density of 100 molecules per cubic centimeter noting is going to happen. If you look at the main post at the graphs, you can see "alignment windows" don't do very much at all. I have enjoyed this post immensely, I am not sure which has been the most satisfying, the clear way you you explained this debunk,so even a layman as myself could comprehend it , or the tirade of abuse you have managed to traverse.Thanks. Anonymous said...what a stupid article. Compare Omerbashich's figure 1B with the actual data. Discuss the discrepancy. Anonymous said...Hey Mus,tell us what you do FOR LIVING .I dont mean what you do to KILL TIME (ASTRONOMY). I'm a biomedical researcher with 43 published papers and 3 book chapters to my name. I'm also co-author on one presentation to an astronomical conference (on the ion tail of Mercury). But not physics, right? So, can I practice medicine, do you think? I graduated in aerospace engineering. My medical experience includes watching Real TV surgeries live. I also believe medicine & aerospace eng. have lots in common (just like you do for physics & biochem. ): if you mix the two, you fly high. Anonymous said... But not physics, right? Actually, I did a fair amount of physics in my degree and post doc (I was measuring picoampere electrical currents in the cell membranes of living cells and see the effects of drugs. And wavelength shifts in fluorescent compounds, did a lot of that (one day I will have a FRET microscope)). Not to mention the fact that I am an amateur astronomer who has been doing astronomy for over 30 years (and the published co-discoverer of the ion tail of Mercury in STEREO). I can do all the basic physics required, plus statistics, plus I'm a researcher, so I know how to look things up and test hypotheses (and do them). It's not hard. Now, as an Engineer, you may not be au fait with the latest theories of drug action. But if I were to cliam that if drugs were diluted to 1x10^300 they were more powerful, your knowledge of the law of mass action and Avagadro's number would be sufficient to prove me wrong. But then again, as an aerospace engineer you should be more than familiar with the physics involved in the earthquake calculations above. You can do the calculations yourself. So why don't you? All you have to do is show that the actual calculated tidal force correlates with earthquake frequency more than chance. Oh, and you HAVE heard of biomedical engineering haven't you? The biomed engineers are in the building across the road, and the physiologists on the floor below are designing computer chips to help restore peoples vision. "I can do all the basic physics required, plus statistics,"
" plus I'm a researcher, so I know how to look things up and test hypotheses (and do them)." Anonymous said.. where do you see statistical hypothesis in Dr.Omerbashich 8-year study? Quite simply, his hypothesis is that earthquakes are more common during alignments than would be expected by chance alone. His hypothesis is wrong. You can verify this yourself ny running Montecarlo simulations an comparing them to the "alignments". Anonymous said... Thats not his hypothesis I read 3 papers of full theory and theres no mention of that whatsoever. It's only in the current paper on alignments and earthquakes, not the theory ones, where the hypothesis is important. Do try and read for comprehension. Wont talk about your testing good Dr.'s PHYISCS and EQUATIONS and how he derived them? Because they are not relevant to this paper. You realize that anyone can download the PDF of the article and read it, and note that there is not a single equation in the entire paper. All he's done in this paper is line up times of "alignments" generated visually via the JPL simulator and times of earthquakes. Regardless of whether his hyper-resonator concept or his rather idiosyncratic view of gravity is right or not, this is where the rubber meets the road. His theory can be self consistent and internally correct to 13 decimal places, but if earthquakes are NOT more frequent during alignments then out of them, then his theory fails. And earthquakes are not more frequent during alignments. Now, as an engineer, you are familiar with Fourier analysis. Why don't you take the 10 year USGS data set for M6+ earthquakes and run a Fourier analysis (the hardest part is turning the USGC date time format into Julian Day format so you can calculate frequencies, for simplicity and sensitivity just use "any Earthquake > M5.9" vs time). Report back on the peaks you find (you can email me the graph or put it publicly on GoogleDocs). While you are doing that, compare Omerbashich's figure 1B with the actual data. Discuss the discrepancy. Oh, yes, and Elenin's gravity is insufficient to perturb the orbit of a tiny asteroid, how will it set up a hyper-resonace with the Sun-Moon system? "You realize that anyone can download the PDF of the article and read it, and note that there is not a single equation in the entire paper." more you talk more it becomes obvious to me you should have never begun talking about this stuff you dont understand bud. "His theory can be self consistent and internally correct to 13 decimal places, but if earthquakes are NOT more frequent during alignments then out of them, then his theory fails." Hillarious. the man isnt talking about frequency of occurrence but demonstrates empirically a pattern of resonant increase in oscillation DURING (means long) alignments. but NOT being an engineer, you will never get it. Sorry to break it to you.
" And earthquakes are not more frequent during alignments." of course they are. Just look at good Dr.s page where you can see periods without alignment have no strong quakes. thats the only 1 on1 relationship you'll ever need. "and run a Fourier analysis "
Okay, I call troll. You know very well he bought time on a high quality remote controlled professional telescope. Leonid Elenin also imaged the asteroid. Anonymous said ...What on earth do i need FA to understnd his EXTREMELY SIMPLE theory and see that its correct?? youre like a kid with his toy running around trying to poke everyone in the eye with it. It's not to understand the theory, it's to TEST the theory. Do the test, report the results back. You don't need a PhD in theoretical physics to test his theory. It has real world consequences which should be easily measurable by anyone with basic maths skill. Very simple tools are all that is needed, as an aeronautical engineer you can very simply do the Fourier analysis to test it. Science is not some hermetic discipline where only high initiates are allowed to test theories. Science is open to everybody, and anybody can test a theory, often with the simplest of equipment. You can show the Earth orbits the sun with just a pair of binoculars (and a lot of patience). Just because someone has a PhD should not phase you, "nullius in verba", "On the words of no one", is the motto of the real Royal Society. So, anonymous, you have the skills and techniques, do the Fourier analysis and report back to us. Theories can be tested by ppl with expertise AND understanding. I understand atleast that Dr. Omerbashich isnt after correlations at all. He even says in paper hes not doing any stat. Its empirical proof of his theory thats already proven. Its you who dont get it bud: ther can be no correlation between time instant and time interval, only between instant and instant. Also Fourie isnt going to do the magic you are hoping for because it also deals with TIME serie not series of intervals. Gee, this should be basic stuff in biochem. No, you don't. Just do the Fourier analysis (it's bread and butter to all engineers) and report the results back to us. 2. you CANT do Fourier on data which isn't prescribed to certain INSTANTS. Anonymous said ... you CANT do Fourier on data which isn't prescribed to certain INSTANTS. Sheesh, doing Fourier analysis on time series data is stuff for first year uni students. The canonical example is Fourier analysis on Sunspot data to find the periodicity of sunspots (see http://linuxgazette.net/115/andreasen.html and scroll down to example 2). Another use which is even more relevant here is extracting the orbital period of exoplanets from doppler shift data (Heck, it was even used back in 1805 by Gauss to find the periods of the Orbits of Pallas and Juno). So what you are trying to find in the Earthquake data is the periodicity associated with the Earth Moon Sun alignments, Earth Venus Sun alignments etc (Long period alignments wont turn up in Fourier analysis, but the short period ones will (once per year or more often), the Earth Moon Sun signal should be particularly strong if Omerbashich is correct). Fast Fourier transforms should be fine, but there is also the Dates Compensated Fourier Transform for noisy data (Foster, G.: 1995, The cleanest Fourier spectrum. So you shot yourself in da foot. He's talking about long AND short ones (look at table 1 again, and the first paragraphs of the introduction), the Earth-Moon-Sun alignments are an integral part of this theory, as are the Earth-Sun-Venus and Earth-Sun-Mercury. Fourier analysis will recovery these periodicities (if they are real). You seem strangely reluctant to run such a simple test, given that FA is such a common part of the engineers toolkit. Re-read it, and the paper on oscillators as well. "As I showed back in 2003, Earth gravity responds strongly to alignments with the Moon and the Sun. Such alignments disturb Earth masses systematically and measurably so much so that magnification of mechanical resonance gets set off [this results in earthquakes]." Note the strongly. The Moon plays an important role according to Omerbashich, as does Mercury and Venus (remember them, I identified them as well when discussing Fourier Analysis). In the 11 year data set from 2000 to 2010 there are 264 Earth-Moon-Sun alignments, 69 Earth-Sun-Mercury alignments, 14 Earth-Venus-Sun alignments and 20 Sun-Earth-Jupiter alignments. If these alignments play any significant role, as Dr. Omerbashich claims, then we should recover these periodicities in an 11 year data set (for example, I can recover the 11 year sunspot cycle from a 32 year data set). Even if the Moon signal is relatively weak, with 264 alignments the peak should stand out (I can recover this peak in a single years tidal records using Fourier Analysis). Mercury should stand out like a sore thumb. So what are you waiting for? As I said, the hardest part of the analysis is converting the date format of the USGS database into something user friendly. The REASON I am intrigued by Mensur’s paper is that THE COMET SHOULD NOT BE IN IT! This Astroblog guy has more credentials than a Physicist from the European Royal Society? The Astroblog debunker assumes that the only factor here is a comet in the alignments described, which does make the paper nonsense, I agree. So, if we assume that there is ONLY a comet at the locations of Elenin, then Astroblog is right and the paper is junk. Mensur Omerbashich leaves out any statements about the Comet Elenin’s mass, or why it is incredulous that it is in his paper. If there is JUST a comet, the mass is like a feather compared to anything else in the paper. And is also much less than the asteroid NEOs that the biologist lists as conspicuously missing. I feel that the asteroids are missing from the paper for the same reason that the comet SHOULD be missing. They are not massive enough to matter. Why is the comet in Mensur’s paper? What isn’t said, is WHY the alignments of Elenin appear to have a coincidence with the large earthquakes, just as other massive planetary alignments do? The implication is that the comet isn’t a comet, but something else more massive. They have shown pictures of it, so I believe there is a comet there. Could there be something else, of large mass involved with the trajectory of the comet? This is unknown to us. The comet doesn’t belong in Mensur’s paper, so WHY does Cornell University allow him to continue with updating it, and hosting it for him? They, even more than the biologist in Australia, should be laughing him right off their website, shouldn’t they? Why did NASA redirect the STEREO B spacecraft to look at the comet? Did they take any OTHER pictures they did NOT publish? Could those pictures have been of a massive object somewhere else? I don’t know, and I bet neither do all the raving lunatics on this forum. If someone does know about some massive object which could explain WHY the comet is in Mensur’s paper, and they are just shouting me down, I guess I understand. We wouldn’t want to panic people. That could make it difficult to make orderly preparations, right? The ArXive preprint server allows anyone with appropriate qualifications and institutional affiliations to post papers to the server. It is up to the scientific community to critique those papers, not ArXive, and ArXive doesn't take them down unless they are fraudulent. An STEREO was rolled because this was the first time a comet came so close to the spacecraft, it will allow us to study the forward scattering phenomena in more detail. There are three main underlying patterns to look for when it comes to these types of pages. 1. Little or no understanding of basic science. They hear scientific terms, they throw them around to make it sound like they know something. Sarah Palin is a perfect example of this behavior. 2. They quote mainstream science sources when the science agrees with their view, or seems to support it. When it doesn't, it's a big conspiracy of the scientific world to hide the facts. And they are very selective about what they quote. 3. Lots and lots of bible quotes and rhetoric. Why? Bible Thumpers operate on blind faith and question little or nothing about their world. God made it happen, it must be that way for a reason. Therefore, it's not that hard to get them to believe the mumbo jumbo. I know the kind of people I described above are going to say I'm stupid and narrow minded. That's the usual reaction from someone that doesn't understand. See for yourself. Go to the Elenin conspiracy pages, or any kind of conspiracy page and look for the above pattern. And since I rarely visit a web page like this more than once, feel free to load on the insults if it makes you feel powerful. What the heck, pretend your computer monitor is my head and put your fist through it. Thanks for doing this Ian. It is too bad you have so many trolls and uneducated people trying to disprove this. I notice in the paper the alignments had to last three days for there to be a supposed "gravitational shadowing" effect that could cause earthquakes. He notes that Elenin would not cause an earthquake in its last alignment because the alignment only lasted one day. When reading your research it wasn't clear if you took into account the length of the alignments. Did you do this and I simply missed it? If not, could you try only using alignments that last at least three days and see if that changes any of your outcomes? Perhaps the reason the moon isn't having an effect on earthquakes is because it's not aligned with the earth and sun for the required three days necessary to create the effect? I'm just wondering when people will finally realize that their crazy theories never come true and they have wasted their entire lives screaming at the top of their lungs that something in space is about to destroy our planet. Do these people live to constantly feel embarrassment over the fact that when predicted event(s) does not happen? And lastly, why is it always the ones who disprove the theory that are the ones who come off intelligent and rational? The disproved always become defensive and angry. Are some people that desperate to get their names etched in history any way that they can? Years from now, when Earth HASN'T been destroyed or seen a cataclysm, your great great grandchildren will look back on the legacy you have left and feel shame to know they are related to you. Last night I saw something quite amazing and for me inexplicable and wondered if you or any of your followers had an idea of what exactly it is. I took several screen captures. There's a very bright light directly below and larger than the crescent moon. It was taken from one of the live wildlife cams in Kruger National Park, South Africa. I must have seen it, or indirectly by reflection in the water holes at two different locations, for probably ten minutes or so before the camera operator must have realized, wait a minute, there's no full moon tonight and turned the camera to the heavens. Then we watched for a few more minutes as it and the moon emerged from behind thick clouds. I'd really like to send one of the screen captures and maybe you could help me know what it is. Supernova came to my mind and when I researched online, I was surprised to learn there is a supernova right now, but what I read says you need telescope or binoculars to see it. This is so not that. Is there anyway to send you the photo?